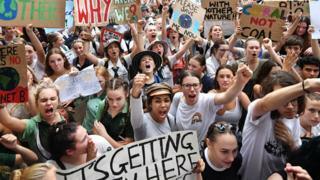 Hundreds of thousands of students across the world took to the streets as part of a strike on Friday to demand that more is done to tackle the issue of climate change. Students in more than 2,000 towns across over 100 countries missed school to take part. The movement is being called #FridaysforFuture. 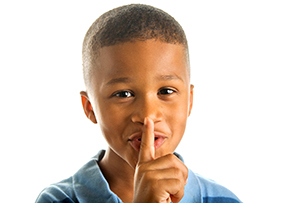 It is inspired by Greta Thunberg, a 16-year-old environmental activist who started missing school with her dad in August 2018 to protest outside Sweden's parliament. 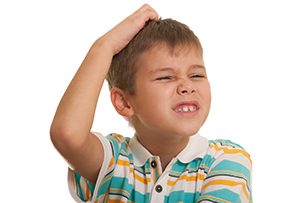 People have different opinions about whether or not pupils should be missing school to do this. Prime Minister Theresa May does not agree with it, as they are missing lessons. 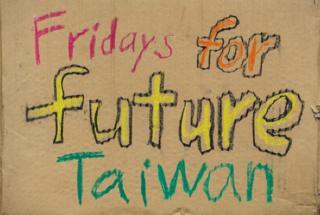 This is the second global youth strike, with the first taking place on 15 February. You can follow what happened during the day or click here to find out more about where these climate change protests came from. 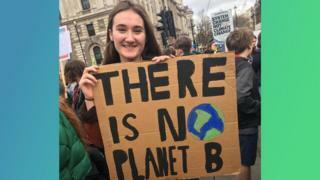 5:00pm - "As young people we have to take responsibility for our future"
Why are young people skipping school to protest climate change? 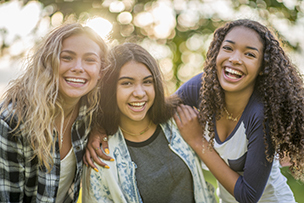 These students tell us why. 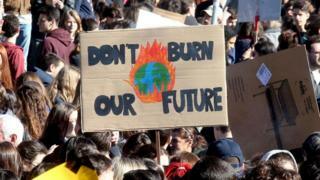 Protesters in New York have been chanting "Stop denying the Earth is dying" in the streets. World media have been following the progress of the protests throughout the day. 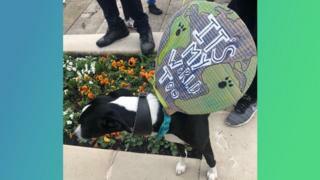 In UK cities protests are continuing. Newsbeat reporter, Lindsay Brown, has shared pictures from the scene in Parliament Square, London. 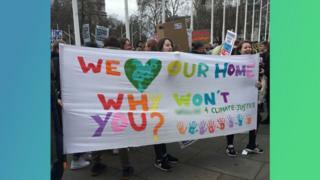 Protesters in London have been showing off some of their posters and signs! Codi and Courtney from Bradford told the BBC why they are getting involved in the climate change action in their home town. "It's really scary," said one of the girls. "It affects everything, but you don't see it." 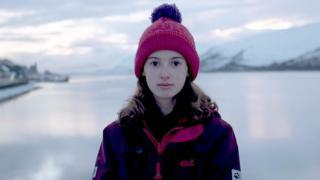 At lunchtime, Greta Thunberg - who inspired the protests - took to social media in support of the thousands of students who were demonstrating in Stockholm, Sweden, where she lives. "Way, way over 10000 students out in rain in Stockholm today. 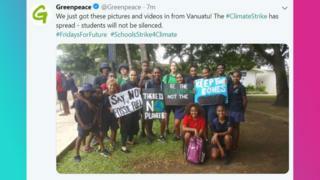 School striking for the climate! #FridayForFuture #SchoolsStrike4Climate," she said. Demonstrations are taking place all across the world to urge leaders to do more to tackle the issue of climate change, including the UK, Poland, Germany, India, Spain, Italy and Finland. Scottish First Minister Nicola Sturgeon has tweeted her support for the young protestors. "It is right that we are all challenged to do more and that we hear the voice of the next generation," she said on social media. In Glasgow, more than 300 people have gathered in George Square and a similar number are striking outside the Scottish Parliament in Edinburgh. Holly Gillibrand, 13, has been taking one hour every Friday away from her school in Fort William in the Highlands to protest since January. She said: "I'm not the sort of person who would consider breaking the rules in any way. "But if we don't strike and demand that our leaders take action, we're not going to have a habitable planet to live on in the future." 9:00am - Europe starts marching! Pictures have started to come in of students across Europe getting involved. One social media has tweeted a video from Helsinki in Finland saying: "It's an ocean of students! Let the march begin in #Helsinki, #Finland 💪"
Another said "Berlin ist voll #fridaysforfuture" meaning "Berlin is full", with a picture of crowds taking part. 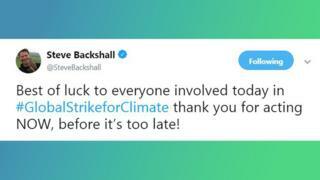 It might be first thing in the morning in the UK, but in countries around the world in different time zones, the climate change action is well under way. 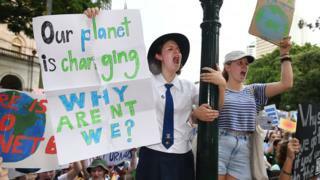 Thousands of students gathered in the Australian cities of Canberra, Adelaide and Brisbane (where it is the end of the day now) to make their voices heard. 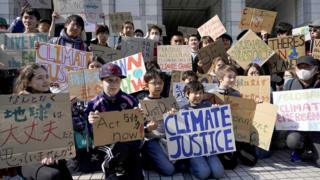 In Japan, a hundred people gathered and marched in the capital city of Tokyo. The picture at the very top of this article shows a group of students in front of the United Nations University to demand action. This student in Australia's banner reads: "Our planet is changing, why aren't we?" Pictures and videos have been flooding in on social media of the protest action taking place all over the world, including in India, Hong Kong, New Zealand, the Philippines and Africa. It goes without saying that Greta is getting involved today too. She posted a picture of herself with the caption: "School strike week 30. #climatestrike #fridaysforfuture #schoolstrike4climate". 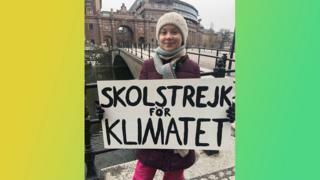 Greta Thunberg posted this picture of herself on social media with the caption: "School strike week 30. #climatestrike #fridaysforfuture #schoolstrike4climate"
Don't forget to send us your pictures and videos if you're getting involved in the climate change action today. I wish I could do this. I’m going to see if I can, next Friday, with a couple of friends. This really matters. Also, I think it’s great that some of you have taken part already. I went to strike in London today. It's awesome that there are so many people around the 🌎 striking for climate change! I hope something is done soon. We need to stop climate change so we went on strike in London today. It's lovely that so many people are getting involved, climate change is a really serious matter. This looks so cool, I'm glad people are getting involved with climate change!